In today’s edition of The Design Series, we’ll walk you through the creation of a bezel set of lab grown diamond necklace and earrings for a customer’s anniversary gift. This customer learned about Ada's lab grown diamonds through video featuring Ada’s founders on the Wall Street Journal’s Lunch Break segment. The customer had a 10 year anniversary approaching and had searched far and wide to find a custom piece of jewelry for his wife, but was frustrated that no one was able to deliver a custom piece on time for the occasion. After viewing the segment, the customer was really impressed by the technology and sustainability behind lab grown diamonds. During his initial conversation with his concierge, he expressed a desire for a piece of diamond jewelry that was both timeless and contemporary. His concierge recommended our bezel set pieces in a modern white gold. The customer selected our Bezel Set Drop Earrings, featuring bezel-set round brilliant diamonds in a drop setting. For the matching necklace, the customer was choosing between the Single Bezel Cosmopolitan Necklace or our Floating Bezel Cosmopolitan Necklace. After deliberating on both necklaces, he decided on the Single Bezel Necklace because he liked the way it slid along the chain and lay flat on the chest. 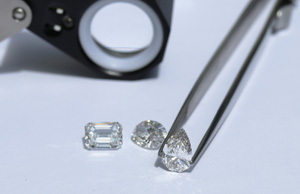 The customer’s Diamond Concierge worked with him to find matching pairs of diamonds for the earrings and a single stone for the pendant necklace. The customer selected a pair of 0.5ct H VS1 round diamonds for the earrings and a 0.85 I SI2 round diamond for the necklace. The Concierge shared videos of the diamonds with the customer and received his approval to proceed with the fabrication. Ada's Concierge Team was able to fabricate and deliver the finished pieces to the customer in under two weeks time. The most important thing for the customer: Ada delivered to him exactly what he wanted and on time for the big day to delight his wife. Creating stunning custom pieces to help our customers create brilliant memories is the what inspires our mission to brighten the world with sustainable, conflict free diamonds. Ready to design a custom piece of your own? Sign up for a consultation with an Ada concierge today. We have over 100 collection pieces to choose from, or build from your imagination.